The benefits of polished concrete are many. It is a very popular choice among commercial, residential, retail, and industrial establishments. If you go to the mall, to a restaurant or to your office, try looking down, chances polished concrete is staring back at you. True to its name, “polished” concrete is what gives concrete floors that polished and shiny look. It also has a reputation of outlasting the rest of the flooring finishes. But what are the real reasons you should choose polished concrete flooring for your next project? Polished concrete floors come highly recommended by professionals who know everything about flooring systems because it’s more durable and hard-wearing – they won’t chip or dent or break – unlike other flooring options such as linoleum, marble, timber, vinyl or ceramic tiles. Polished concrete floors can last up to at least 10 years with minimum maintenance and more with proper maintenance. The versatility of polished concrete is one of its best features. With it, you have endless possibilities with colour, design or finish. You can create stunning designs and effects to it by adding aggregates like coloured stone, crushed shells, recycled glass, etc. As a reputable polished concrete specialist we are able to create an amazing variety of designs and looks of concrete flooring. This includes removing joints and creating homogenous effects stretching from floor to wall with products like panDOMO. Our stone or terrazzo flooring is easily rejuvenated, often looking as good as the day they were first laid. If you already have an existing concrete floor, Pangaea veneer can be finished at thicknesses from as little as 6mm-15mm seamlessly and dimensionally stable. It’s no secret that polished concrete requires very little maintenance. Just regular sweeping and mopping with water and neutral pH cleaners will do. There’s no need for waxing or sealers to maintain its high gloss quality. 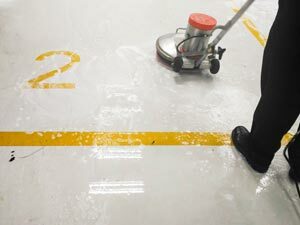 With the right installation you do not need to worry about re-polishing the surface too soon. Polished concrete flooring is an affordable option, especially if the property already has a slab concrete that’s ready to be transformed by polishing. The polishing cost will largely depend on the number of rounds the grinder would have to make on the surface. The material’s longevity and ease of maintenance give it a true edge over other floor finishes. Benefit of polished concrete #1: These floors don’t require hazardous coatings or adhesives to install. Benefit of polished concrete #2: It is also an energy efficient option, especially during the cooler months. Concrete flooring makes use of the heat accumulated from the rays of the sun, which, in turn, helps reduce energy consumption and lower the bills in the case of radiant in-floor heating systems. Polished concrete flooring is actually a very health-conscious choice. No mould, mildew or allergens can build up on its surface. It improves indoor air which allergy-sufferers will appreciate compared to wall-to-wall carpeting. With the use of in-floor radiant heating, no air will be blowing around, resulting in fewer allergens circulating. Think clean surfaces, warm temperatures, and fresh air. Polished concrete can provide a high-gloss, classy and sophisticated visual appearance. It complements ambient lighting and provides very good lighting inside. You won’t get a prison-like feel with polished concrete. The smooth and shiny surface absorbing the light and illuminating the rooms by 30 % and the overall effect is breathtaking. 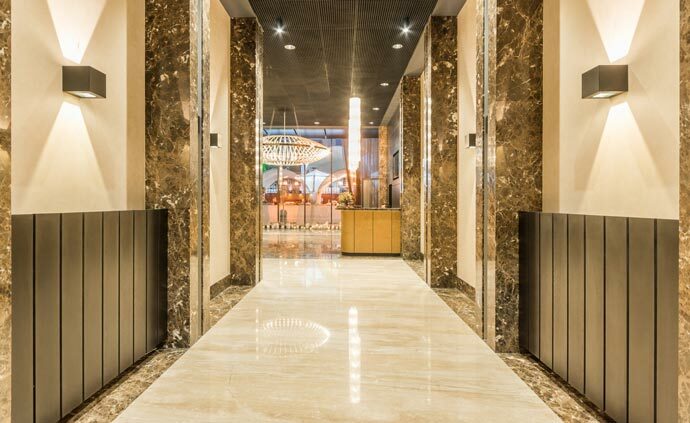 This is why it is the flooring choice for hotels, theatres, museums as well as high-class residences. Since no chemicals are used in the installation of polish, it requires little to no drying time. So the floors are available for use much quicker than other flooring options. When it comes to hospitals, supermarkets or production plants where safety is of prime importance, polished concrete will not cause long delays. These are some of the best reasons why polished concrete is arguably the number one choice for flooring options. Just be aware that in order to reap the benefits the floor material and finish must be matched to your specific project requirements. Choose a reputable installer that can advise you on the right materials and timeframes to accomplish the quality, consistent finish you’re after. Honestone specialises in floor preparation and installation for the construction industry, commercial, retail and industrial sectors. We also service architectural (large scale) residential projects. For a worry-free experience, contact us today.